Straightforward author Philip Kerr has written some fantastic dictation activities to accompany the new edition of the Macmillan English Dictionary. Ideal for use with Upper Intermediate and Advanced students, the lessons tackle common learner problems. 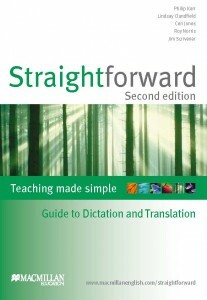 Suitable for both the original and second edition of Straightforward. Don’t forget that there is a Teaching made simple: Guide to Dictation and Translation handbook to help you use dictation activities in the classroom.